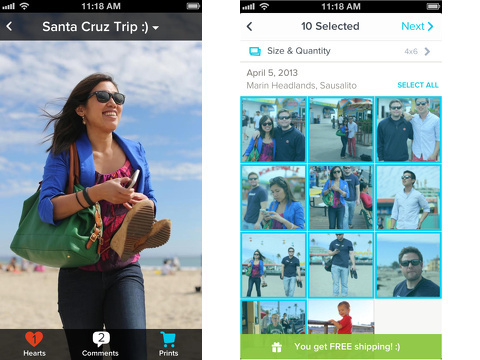 The Kicksend iPhone, iPod Touch, and iPad app makes selecting, printing, and sharing your photos fun and appealing. It integrates a social feed and the option to print for home delivery or pick-up in an unexpected and attractive interface. You can order photo prints as guest without account creation. But, in order to send and receive photos, you must create an account with email, Facebook, or Google +. Kicksend iPhone app states, “We’ll never share anything private, ever.” The Facebook authorization requires access to basic profile, friends list, and relationships. You add your mobile number and verify it with a three digit code. Additional authorizations to access your iPhone’s photos and contacts list help you maximize your experience. 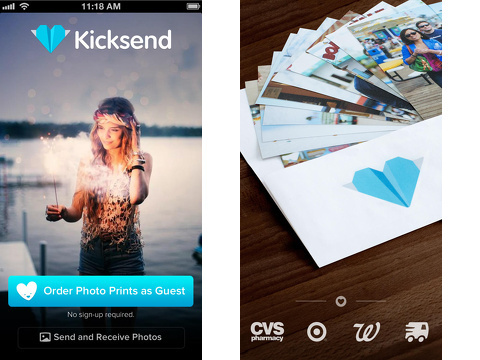 The Kicksend iPhone app is a social feed of your shared and printed photos, as well as a tool to print copies. The feed is simple and modern. The menu bar at the top of the screen provides one touch access to profile, print, and send. As you print and send photos, your feed develops. Your photo or a series of photos that can be scrolled with horizontal swipes provide the visual backdrop. At the top of the photo, you can tap the field to move to a new screen with the photos where you can comment about the photos. From the feed, two options are available below the photo – like or print. The print option is included in virtually every interface of the Kicksend iPhone app. The exact process for selecting and purchasing prints varies based on when you press the print icon. For example, when you touch print below a photo in the feed, it assumes you only want that photo or that series of photos. When you touch the field with the words “mail prints to family,” a different interface for selecting and paying for photos is presented. You can mail prints to family with a minimum order of ten prints to qualify for free shipping. If you touch the mail to family option, then your iPhone photo album pops up for you to make multiple selections with taps on the screen. It would be nice for the print interface to be more consistent in future updates. You can also order prints for yourself for pick-up or home delivery. A list of stores to pick up prints is sorted by closest to you. At the top of the list, you can also order prints for home delivery. When you complete your order, a list of options and information required fills the screen. Your personal information like name, mobile number, and email is automatically completed. You can touch the sizes and quantity option to make selections with prices shared. If you pay from within the Kicksend iPhone app, you follow a simple credit card data entry interface. If you pay at the store, then the store name, address, and payment required is listed. The Kicksend iPhone, iPod Touch, and iPad app elevates the experience of selecting and printing photos. It’s refreshing, bright, and engaging. AppSafari review of Kicksend was written by Jenni Ward on October 22nd, 2013 and categorized under App Store, Free, Fun, Photos, Productivity, Shopping, Utilities, Video. Page viewed 5512 times, 1 so far today. Need help on using these apps? Please read the Help Page. Placed an order on sept 12th 2014 recieved Email alerts telling me package has processed and shipped but yet today its Sept 20th 2014 and my package has NOT been delivered yet. Going on eight days of shipping. So as far as I’m concerned this app is crap and won’t be using it anymore. Kicksend your 3-5 day shipping is a lie I reccomend you change your shipping to 8-10 days. Tks for write this post.